An artist's depiction of the Earth-size explanet TRAPPIST-1h around the star TRAPPIST-1. "It's incredibly exciting that we're learning more about this planetary system elsewhere, especially about planet h, which we barely had information on until now," Thomas Zurbuchen, associate administrator of NASA's Science Mission Directorate at the agency's headquarters in Washington, D.C., said in a statement. "This finding is a great example of how the scientific community is unleashing the power of complementary data from our different missions to make such fascinating discoveries," Zurbuchen added. 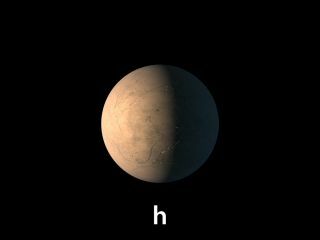 Three of these seven worlds appear to orbit in TRAPPIST-1's "habitable zone," meaning they might be able to host liquid water, and therefore life as we know it, on their surfaces. Despite such work, astronomers had not been able to pin down the path of TRAPPIST-1h. But they had noticed that the six other planets in the system are in "orbital resonance." That is, the worlds have tugged each other into stable orbits whose periods are related to each other by a ratio of two small integers. "The resonant structure is no coincidence and points to an interesting dynamical history in which the planets likely migrated inward in lockstep," lead author Rodrigo Luger, a doctoral student at the University of Washington in Seattle, said in the same statement. "This makes the system a great test bed for planet-formation and -migration theories."